Julia Ramírez Blanco (Madrid, 1985) is a lecturer at Barcelona University,in the Art History Department (Juan de la Cierva Programme). 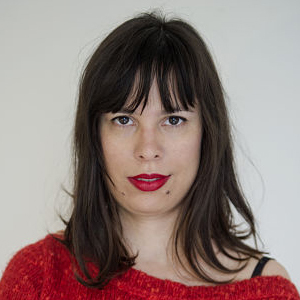 Art historian and critic, she has specialized in the relationships between art and utopia, to which she dedicated her European PhD thesis, Contemporary Artistic Utopias. Art, Social Movements and Utopia in Western Europe, after the Fall of the Berlin Wall (Complutense University, Madrid, 2015). Her recent work has focused on the intersection between art, social imagination and activism. She is the author of the book Artistic Utopias of Revolt: Claremont Road, Reclaim the Streets, the City of Sol (New York and London, Palgrave, 2018) previously published in Spanish as Utopías artísticas de revuelta. Claremont Road, Reclaim the Streets, la Ciudad de Sol (Madrid, Cátedra, 2014). In this work, she explores the aesthetic and utopian dimensions of various social movements. Focusing on art, activism, and visual culture in relationship to social dreaming, she has edited the monographic issue of REGAC Journal, which includes texts by TJ Demos, Rachel Weiss, Timothy Miller, and Oliver Ressler. Previously, she has also worked on outsider art (“Introducción”, Hans Prinzhorn. Artistry of the Mentally Ill. Madrid: Cátedra, 2012) and has been translator of Erwin Panofsky (La arquitectura gótica y la escolástica. Madrid: Siruela, 2007). Her articles have appeared in English, French, Italian, and Spanish within various co-authored books and in journals such as Third Text, Arquitectura Viva, Quintana, Lars, Boletín de Arte, El Mundo, Abc Cultural, and The Nation Journal. Ramírez Blanco colaborates regularly with the MACBA Museum of Contemporary Art, where she directs the research group “Grupo de investigación sobre la colección” [Research group on the collection]. As a teacher, as well as working in Barcelona University, she has been invited to conduct sessions at New York University or the American University of Paris. Previously, Ramírez Blanco taught at Tufts University and Skidmore College in Madrid. She has lectured in many international universities and art institutions, including the Museo Nacional Centro de Arte Reina Sofía, Madrid (Reina Sofía Museum of Contemporary Art, 2017), the Warburg Haus Frankfurt (2017), the Senate House. London (2016), the Royal Academy of Spain in Rome (2016), the Museo de Arte Contemporáneo de Barcelona (2016, 2018), the Württemgbergischer Kunstverein Stuttgatt (2015), or the Winchester School of Art (2012). In 2018-2019 she will also by one of the keynote speakers in two of the Prado Museum´s yearly courses. Ramírez Blanco has conducted research stays in New York (New York University), Nantes (LAUA), Amiens (Université Picardy-Jules Verne) and Rome (Reale Accademia di Spagna a Roma), and has received various excellency grants to support her research (Reale Academia di Spagna a Roma, 2015-2016; Formación de Personal Universitario, 2011-2015; Residencia de Estudiantes/CSIC, 2010-2013). She holds an MA on “History of Contemporary Art and Visual Culture” at the Reina Sofía Museum together with the Universidad Autónoma de Madrid (2008-2009) and on two occasions has participated in the Séminaire International de Muséologie at the École du Louvre, Paris (2009 and 2018). For her BA, she studied art history at the Complutense University and the Freie Universität, Berlin (2003-2008). She is member of the Committee of the Society for Utopian Studies, an international interdisciplinary network devoted to the study of utopianism. She speaks Spanish, English, German, French and Italian.